‘Tis the season for countdowns and annual nominations! Nature and Ecology rarely rate a mention in such frivolities, although some sites have listed insightful round-ups of the top environmental stories of 2013. Most scientific countdowns for 2013, or predictions for 2014, are dominated by gadgetry and technological fancy. So, I hereby doubly-nominate ecosystem services as the “most influential” ecological concept of 2013, and the “most likely to inspire positive change” in 2014! It’s true, ecosystem services are not a new invention, but they have been too often forgotten by us in recent history, creating many of the environmental and socio-economic problems we see today. They weren’t always considered “services” either. They were just recognised as “vitals” to our survival. With this recognition came an understanding that Nature controlled human lives, not the other way around, and it was in our interest to tread lightly upon her. Most ancient cultures worshipped a vast array of gods, goddesses, nymphs and sprites that personified every part of the natural world, from individual rocks and trees to the entire heavens above. The myths and legends that were passed down the generations were simply metaphors for all the human-environment relationships through which people experienced the world around them. For example, the Greek myth of Persephone’s abduction by Hades, and the bargain her mother Demeter struck for her daughter’s return, is simply an analogy for the seasonal cycle of life and death/dormancy that agrarian societies relied on to survive. Thus, Nature was made sacred, and by worshipping Demeter, people were thanking Nature for the food, flowers and fibre they gathered from her. This recognition of human reliance on Nature’s whims and wellbeing lasted through to the era of industrialisation and globalisation, after which the natural world was seen more as a hindrance than essential to survival. Then, as with many things, entrepreneurial politics got involved and “ecosystem services” are now often viewed or talked about only in terms of their monetary “value” to humans. Thankfully, some have maintained a voice for the more optimistic (and accurate) view of ecosystem services…they are not commodities, but our life support from Nature. The only payment needed from us is respect. And so to 2013, when a number of events and publications inspired this unofficial “best of” nomination. Firstly, this year’s European neonicotinoid ban will hopefully have a lasting impact reminiscent of the Silent Spring. The news, commentary and research generated around the ban have already been immensely successful in increasing public awareness about the ecological importance of wild pollinators and insects in general, so let’s hope it’s not forgotten quickly. In the academic literature, some promising articles were published this year that call for a new approach to the ecosystem services discourse. Luck et al. (2012; in December, so it was almost 2013!) summed up the ethical considerations necessary when using ecosystem services concepts in management and policy applications. In particular, they raise the important point that understanding local people’s spiritual, emotional or moral connection to Nature is vital to the success of externally-created environmental management policies and applications. Raymond et al. (2013) expanded on this, discussing five metaphors for the different types of human-environment relationships and explaining how these relate to environmental management and ecosystem services. Turnhout et al. (2013) also argue for the need to turn away from the monetary focus and change our view of Nature from “goods and services” to “living with”. One of the more exciting experimental studies published this year was by Lundin et al. (2013), who showed for the first time that pollination and pest control in red clover fields were synergistically linked and should be considered complementary ecosystem services, rather than mutually exclusive plant-insect interactions. Many predatory insect species (e.g. wasps and flies), as well as being unacknowledged flower visitors and pollinators themselves, feed on the pests that damage fruits and seeds; so, just relying on hired bees to pollinate at flowering time might not make any difference to crop yields if you don’t have the right balance of other insects around to control the pests that come along after fruit/seed set. Although many farmers have intuitively known this for centuries, this study will hopefully motivate more investigation of other crops and combinations of ecosystem services. Finally, in October, my personal favourite appeared – Braiding Sweetgrass by Robin Wall Kimmerer, a native American woman, and botany professor at SUNY. Her lyrical prose combines traditional wisdom and mythology with scientific knowledge, exploring just how Nature provides for us through the services, or ‘gifts’, we gain from functioning ecosystems – this book will convince even the most sceptical soul to appreciate and respect the significance of the natural world. How will this wind of change flow on into 2014? The UN’s FAO has already declared 2014 as the International Year of Family Farming, with the aim of raising awareness of family and smallholder farming operations. This kind of farming is the antidote to the current industrial standardisation of food, society and everything else in between, and is vital to the preservation of ecosystem services and, thus, all of our futures. So, forget about starting fad diets and exercise regimes that will only last a few weeks – let’s make a collective new year’s resolution to notice and appreciate the ecosystem services around us! Plan and nurture a permanent ‘family farm’ and make your own food from the produce. Put every piece of waste on trial before you sentence it to the rubbish bin. Take note of the moon phases, the seasonal star tracks across the sky, the insects that visit your favourite flowers, and where the water runs to every time it rains. Keep a diary of wind gusts, cloud formations, rain showers and sunrises…and look for the patterns. Connect all the dots, and then thank Nature for the services gifts she provides. 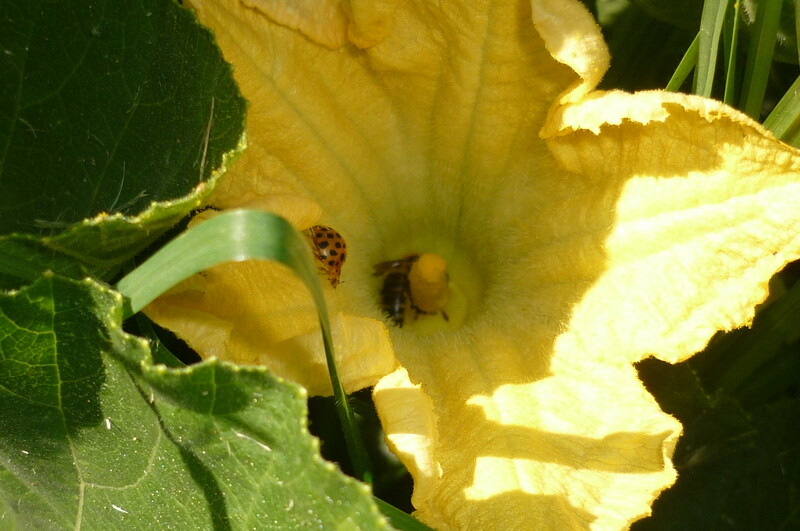 A pollinator and a pest controller give a future pumpkin a helping hand. You forgot (?) one important publication about the relationship between the ESS concept and ethics, especially regarding the economic valuation controversy: Jax et al., available for free here. The authors argue that there is not necessarily an “ethics vs. economics” dichotomy involved here. At the same time they acknowledge the ethical problems related to the economic approach (as do I, being an economist working in exactly this field). Thank you for your great comment and for providing the link – the paper you mention also builds on the discussion (and was written by some of the same authors) presented in first two papers I listed above…I could have listed a lot more too! 🙂 It is a complex issue, but hopefully papers like these will inspire more discussion of this nature in the near future. I look forward to reading more at your blog too! I just wanted to point out that there are good papers out there in which the authors do not dismiss the idea of economic valuation;-) But, of course, the ecosystem services approach is much more than just its economic component, which is the dominating and at the same time the most controversial one. Interestingly, one of the more convincing critiques of the whole ESS approach came from an economist, Richard Norgaard, who called it a complexity blinder. Indeed. What worries me particularly is that while we economists are mostly aware of the problems and limitations related to our valuation studies (monetary values being only part of the actual value, controversies related to particular methods etc. ), the public overhears the (maybe too quiet) warnings of the researchers themselves, taking the resulting $ or € numbers at face value… Consider the example of the famous study by Costanza et al., who calculated the alleged value of all the Earth’s ecosystems. Even they said that this is only about magnitude, not specific numbers, and, additionally, their study has been (rightly) criticised heavily by environmental economists for theoretical and methodological reasons. However, the study has been very widely quoted in media. See here. Yes, it is a frustrating situation. Many scientists are reliant on the media to get their messages to the public, but most mainstream media rely on short, pithy one-liners, and quick snapshot summaries. We also live in a consumerist society, where more people understand how to negotiate a commercial transaction than how a tree grows. Thank you Lucinda! Happy 2014! No worries, thanks! it is an inspiring topic!